Many know Andrew Ford from his voice on radio. He's the Music Show on ABCRN, endlessly knowledgeable about all manner or musics, interviewing visitors and locals from pop through jazz to classics. A musician and composer and broadcaster for all seasons. He's now the ANU Coombs Creative Arts Fellow (for 2018)so we had a lecture and a concert in the last few days. I got to the concert. 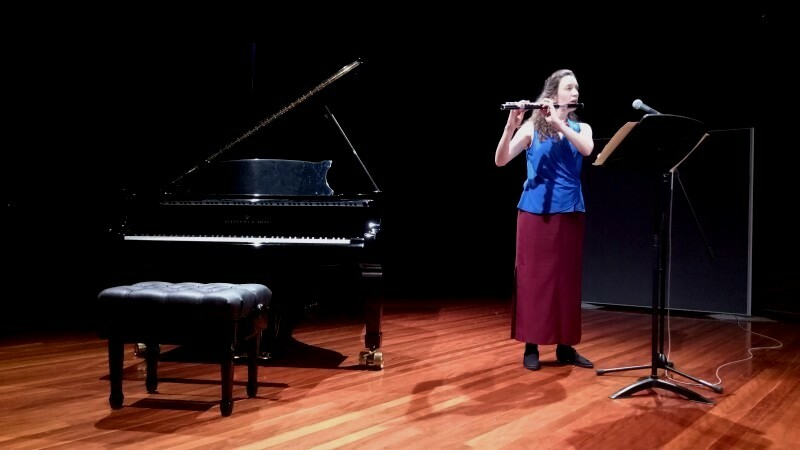 Several staff performers from the ANU SOM playing a string of works by AF including one premiere. First up, Once upon a time were two brothers... with Sally Walker on flute telling a grim Grimm Fairy tale and accompanying herself on flute. It's another of those out-of-time stories with a moral message. King offers daughter's hand for anyone who will slay the boar; one of two brothers receives a magic spear and kills it; other brother gets first brother drunk, steals the dead boar and claims the maiden; a blind minstrel carves the first brother's bone into a flute that accuses the other brother who is condemned to death by being buried alive. Like I said, otherworldly: there are few boars around Canberra. Peter & the Wolf came to mind: doesn't that feature flute? There were times I could hear the dancing or drinking of travelling in the music. So, interesting and nicely played/recited. And with some backing harmonic drones from violin and cello. Then several piano works played by Edward Neeman. Broadway Boogie-Woogie is like a Mondrian painting, highly constructed with notes tied to place then a free tune overwritten in the right hand and with the existential rhythms of jazz. And Fear no more..., a commission commemorating the Bali bombings influenced by AH's visit to the Washington DC Vietnam memorial. Slow and sparse; extremes of pitch against mid-range notes and chords; sometimes heavy and mournful; later atonal and light in 2 single lines; references and self-reflection. 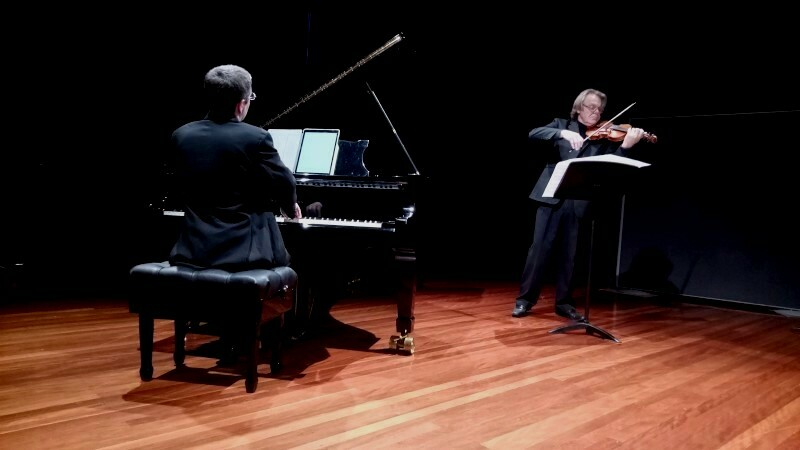 Edward Neeman remained to play Cradle song with Tom Fromyhr on violin: a lullaby in 3/4 passacaglia form with ground bass and a floating violin over, initially playing harmonics, then melody, then a return to harmonics. 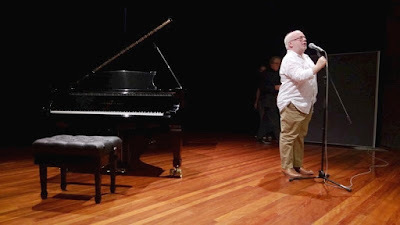 The premiere was Hearing voices performed by David Pereira which explored bowing - over the fingerboard, normal position and at the bridge, mixing the three as a type of counterpoint. David did this seriously well. All interesting; all played very well by some local masters. For me, it will be the Boogie-woogie and the cello bowing that I will most retain. 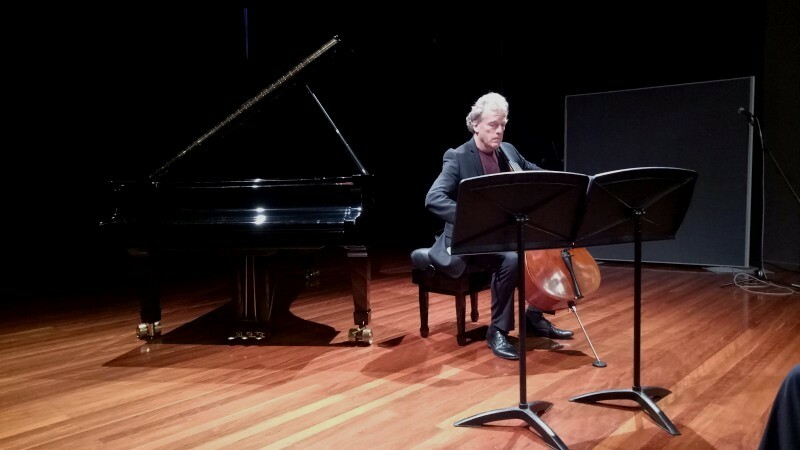 A fascinating outing of modern, Andrew Fordian composition.